Will the new Lexus dedicated hybrid be a Prius? Toyota will present two dedicated hybrid models at the 2009 North American International Auto Show in Detroit; one a Toyota and the other a Lexus. 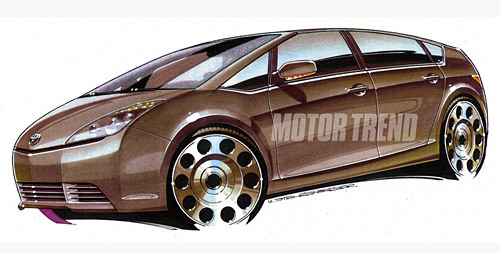 It’s no surprise the Toyota will be the Mark III Prius. It’s the Lexus that will be the shocker: a lifestyle wagonlike vehicle based on the Prius platform and drivetrain. The car would be aimed at well-to-do individuals who are after a roomy sedan but not prepared to step up to a car the size of the GS. Mid-sized D-segment models are ideal for families and when combined with Lexus’ luxury and quality standards, could be a real winner for fans of hybrids and non-hybrids alike. “We’ll add a specific hybrid model and leave the IS as a sports petrol and diesel. There will be more focus on interior space than on sports styling and it will have more boot space,” Settle revealed. The D-segment is the European designation for the large family car, meaning something the size of an ES, which is much more in line with what I would expect from the dedicated hybrid. And really, it’s a little early to be making definitive statements. (The image above is of the Toyota Prius, not a Lexus).